Roofing Services Archives - Beneficial Roofing | VOTED BEST Roofing Company, Call Us Today & See Why! 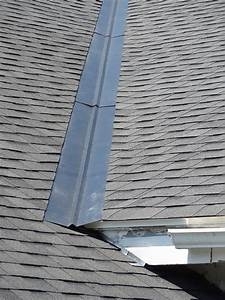 Whenever you get your roof fixed or have a new one installed you need to make sure that not only are the shingles installed properly, but also the flashing. Shingles are the first line of defense against the harsh UV rays. In the same way, your flashing is the first line of defense against moisture and water damage. 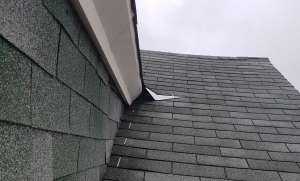 In this article we will talk about what roof flashing is, why it’s important and what damages can occur if your flashing is neglected or not properly installed. Roof flashing is a roll of thin metal. It’s made to withstand all weather conditions, including high wind and excessive rain. Flashing can be made from several types of metal including copper, aluminum, galvanized steel and lead. During the roofing process, it is rolled out into place and sealed. Flashing ensures that no water can get into your roof and damage it. The way flashing works is relatively simple: it collects pooling water and channels it away from where it was pooling. All types of flashing work in basically the same way. 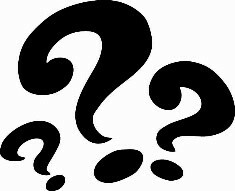 Roof flashing is very important because it helps to close joints in walls or roofing applications. This makes sure no water is able to seep into materials used in the construction of your roof. The most typical places you’ll find flashing is around valleys, vents and skylights. Installing flashing is a key process in roofing. If done correctly, it can help lengthen the lifespan of your roof and the lumber supporting your roof. Once installed, quality flashing will continue to protect your roof for a long time. A valley in your roof is the area where one slope of the roof joins another. This creates a low area on the surface of the roof–a valley. Valley flashing is installed under the shingles of the roof at the edges. The flashing leads down to a gutter close by. Water will drain from the shingles into the valley. From here, it flows down the flashing metal, to the gutter and out the spout. 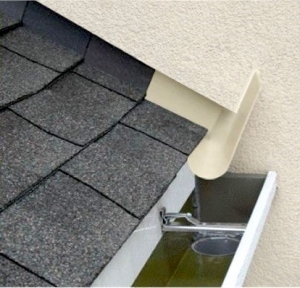 Valley flashing streamlines the way your roof protects against water. referred to as a saddle roof–is built. This helps create a slope to keep water from pooling behind the chimney. Flashing covers the cricket, running along the shingle run above. This cover is mortared into the chimney itself, creating a water tight lock. Counter flashing is mortared along the sides into the brick or stone and run down the step of flashing. Lastly, flashing is mortared in the front of the chimney, at the lowest point of the roof. 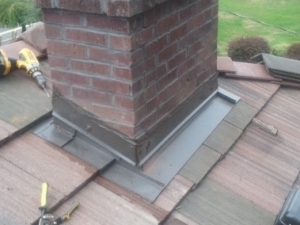 This flashing is placed flush on top of the next shingle course, so water will run down away from the chimney. What Happens When Flashing Doesn’t Work? would suffer from water damage. Roof rot, mold, mildew and even broken beams can be a result of poor flashing. 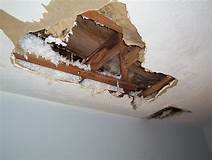 Also, damaged or improperly installed flashing on your roofs eaves will cause water damage on your exterior walls as water seeps into the inner workings of your wall. Without properly installed flashing, you as a homeowner could be looking at getting a whole new roof, having to re-plaster and paint your inside walls and ceiling due to water damage. Don’t let water damage from poor flashing ruin your new year! Contact us today so we can help you make sure your roof flashing is water-tight and ready!